An application filed by former National Security Adviser, Sambo Dasuki and former President Jonathan against a subpoena ordering him to appear as a witness defence in the trial of former PDP National Publicity Secretary, Olisa Metuh was Wednesday struck out by the Federal High Court sitting in Abuja , presided over by Justice Okon Abang . Trial Judge Okon said he had no jurisdiction to entertain Jonathan’s application challenging the subpoena since he had yet to be served with the court’s subpoena directing him to appear in court. 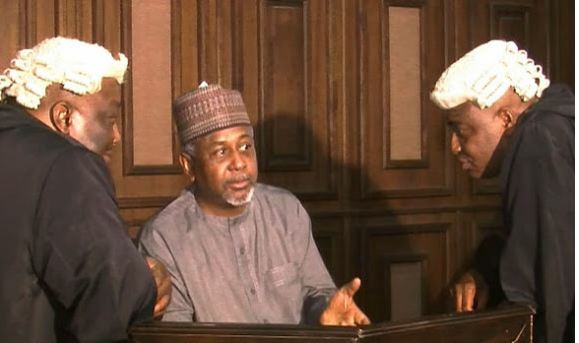 The court also said accepting Dasuki’s application seeking an adjournment pending the determination of his motion in relation to the subpoena will flout the judgement by the Court of Appeal. Justice Abang, after dismissing the application, ordered Dasuki to enter the witness box.